This just in! An exemplary Local/IHA news editor for Accents had been spotted: Meghan Berger! Keeping in mind how much of an honor it is to be a member of the IHA community, Meghan definitely lives up to the standards of being a successful IHA girl. Between her amazing work at IHA, and her local outreach to her community, Meghan is sure to steal the spotlight. As Meghan leaves IHA and opens a whole new chapter of her life, the school notices her amazing accomplishments. 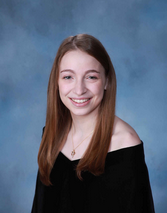 At IHA, Meghan was a dedicated member of WIHA, Accents, National Honor Society, and even Peer Mentoring. Meghan was a star editor as well as a staff writer for Accents; her amazing work can be found splashed all over our school newspaper. Not only was Meghan an exemplary student in her IHA groups, but also got to share her phenomenal talents in her local community. Outside of IHA, Meghan volunteers for a special needs arts and crafts and a tennis organization. Meghan also helps out at her elementary school’s aftercare program. As she closed the IHA chapter of her life, Meghan reflected on all the numerous memories that she will miss from IHA. “The thing that I will miss most about IHA is seeing my friends every day,” Meghan heartwarmingly confessed. Meghan says that she has made amazing friends at IHA, and that though she will miss seeing them every day at school, she knows her friendships will last long after the IHA doors close behind her. Meghan says that her favorite memory from IHA was her last week of senior year. “Our whole class really came together to make it memorable, and it is something I will never forget,” Meghan gushed. As for Meghan’s plans for the future, in the fall she will be attending Quinnipiac University where she will be a Communications major. After college, Meghan hopes to be working in the broadcasting field. “My dream job would be working behind the scenes for a television show,” Meghan stated. When Meghan was asked what her tips were for any incoming IHA freshmen, she gave some pretty great advice. Megan said as a freshman, you should try out anything you may be unsure about because you may end up loving it. When Meghan was a sophomore she decided to try WIHA, and said it turned out to be one of the best decisions she could have ever made. “The worst thing that could happen is you don’t like it and move on to the next thing. But who knows, you could find something that you are truly passionate about,” Meghan exclaimed. Megan has been such an amazing piece of our IHA community and we know she will accomplish amazing things! IHA wishes you the best of luck in your endeavors, Meghan!